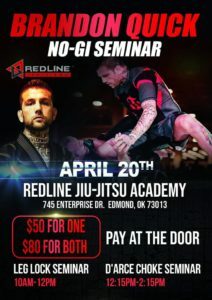 BELOW IS A LIST COMPILED FOR ALL OF THOSE ARE WHO ARE INTERESTED IN VISITING REDLINE JIJIU-JITSU ACADEMY. VISITORS ARE STUDENTS OUTSIDE OF OKLAHOMA COUNTY OR NEIGHBORING COUNTIES. GUESTS ARE ENCOURAGED TO MAKE RESERVATIONS PRIOR TO ARRIVING. NO RENTAL GI’S AVAILABLE. PLEASE BRING YOUR OWN TRAINING GEAR. IF YOU ARE A RESIDENT OF OKLAHOMA COUNTY OR NEIGHBORING COUNTY, PLEASE VISIT OUR TRIAL CLASS PAGE. PLEASE FEEL FREE TO CONTACT THE ACADEMY IF YOU HAVE QUESTIONS.